As I write this page, it is April, and no one has seen the eagles since March 15. Maybe next year. But there were so many memories, so many experiences, that I wanted to chronicle my thoughts. Alan first reported seeing an eagle on December 8, 2002, but I didn't see it until the next day. It rapidly became a regular, with local birders making daily visits. After a while it became evident that it had a favorite tree, soon known just as "the tree." I started leaving one of the curtains in my bedroom open so that after I put in my contact lenses and was brushing my teeth, I could look out to see if the eagle was there. On December 28 another excited message arrived on ArlingtonBirds from Janet Crystal. There were now two birds - both adults. Over the coming months, we all got to watch and study these birds. Paul Roberts wrote: "By Clark & Wheeler's standards, these are Basic IV Plumage subadult birds. Presumably these are four-year old eagles, with a little dark streaking on the head (especially the crown, dark tips to some of the rectrices (tail feathers), and on at least one of the birds, some small whites patches on the body, especially on the arm pits and wing linings. There is an apparent size difference between the two birds, which could suggest male and female, with the female being the larger of the two." Over the course of the next few months there were lots of observation of behavior. Several people watched one or the other pick up sticks and play with them on the ice. There were many reports of feeding behavior. In virtually every case the female hogged the food. 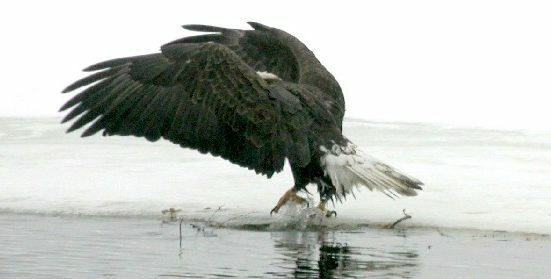 Karla O'Brien wrote this intriguing story: "I first saw one bald eagle on the ice close to the shore on the Arlington side of the lower Mystic Lake next to a small patch of water, in which there was an unfortunate merganser. The merganser attempted to escape the eagle by diving, but each time it came up for air, the eagle jumped/flew to a spot on the ice very close it. They went back and forth like this several times, and then a second eagle arrived. The two eagles stationed themselves on the ice so that they essentially had the little strip of water covered. Unfortunately, I was distracted for a moment by some new onlookers, and when I looked back, the duck had been caught. The successful eagle (the larger one I think) was already pulling at the merganser's feathers, while the second eagle stood to one side. Eventually, this second eagle flew off to a tree farther down the lake; and shortly after that, the first one lifted the carcass, with some difficulty at first, and flew off to a point farther out on the ice, where it continued to work on its catch." They were often heard calling. Paul Roberts wrote "I can't recall hearing wintering bald eagles calling, and there is little discussion of it in the literature." But they did call. On January 5 the eagles were in two different trees and I noted: "Suddenly I heard the further eagle call, a two note call. I looked, and a Red-tail was circling, then landed in its tree. The nearer eagle flew, and just before it landed with the other, the Red-tail flew away." And on January 30 I noted: "I could still see the two figures, and was enjoying myself, when one bird gave a three-note gull-like call, sort of 'keer, keer, keer,' and this was followed by a soft kind of squeak. . . About every one two two minutes the female would give the "keer" call, either two or three times, and nearly every time the male would reply with the squeak call, or with a much softer single 'keer.' . . .At one point when they called, a Red-tail was flying over the tree, and both birds make the 'keer' call. Since the female has demonstrated dominant feeding behavior, perhaps the female was doing the "keer" as a statement of superiority, with the male responding a sort of "yes, you're right, you are superior" kind of squeak. Who knows." They would often stay out late into the afternoon, but in early February Renee discovered that they were night roosting at Sandy Beach. On February 14, the pair stayed on the ice until 5:30 before flying to the roost. Were they banded? Massachusetts-born birds are banded by MassWildlife, but these two do not appear to have been. Male left, Female right. Early in their stay they varied their perched quite a bit, but by February they were spending most of their time at my end of the lake, often spending time on the ice, and I always drove by the lake on the way to and from my house, ending up with a ridiculous number of photos, almost all taken from the car. Unfortunately as the word got out about the eagles, lots of other people wanted to photograph them, and despite repeated requests not to approach them, people continued to do so, and the birds became more and more skittish. The last date two eagles were reported was February 28. The other lingered until March 15. The excitement was over. Or was it?